Olive is too busy to accompany Popeye to the zoo, so she suggests he take Sweet Pea, which he obligingly does. From the Internet Archive, the 1936 animated short: Little Sweet Pea. Wouldn't it be nice if we could live in the present that earlier generations saw as the future? 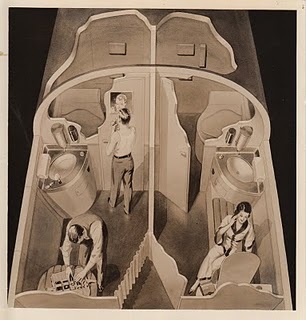 Take this post from Dull Tool Dim Bulb, which features American Airlines promotional material from 1935 showing the spacious air traveling accommodations we in the future enjoy! Oh well. Visionaries can't always be right. This morning's Sunrise Serenade had a reveille vibe - "G.I. Jive" by Louis Jordan and his Tympany Five. Click on the song title to listen courtesy of Jazz On Line. 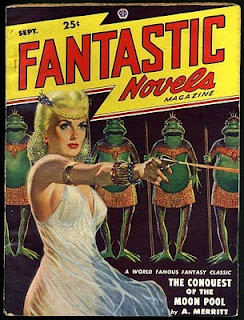 Golden Age Comic Book Stories posted another series of great pulp fiction paperback covers, including science fiction, fantasy, etc. They are all great, but I could not resist the cover for The Conquest of the Moon Pool. The pretty girl and the ray gun are iconic, but also commonplace, props. The background of spear-wielding frog warriors, however, puts this cover over the top. Today's Sunrise Serenade was "Someone Stole Gabriel's Horn" by Bunny Berigan. Click on the song title for a sample clip from emusic. The playlist for the July 28, 2010 broadcast of the Swing Shift Shuffle has just been added to the playlist filing cabinet. The Red Hot Lindy Hop continues this Friday with the weekly lesson and session. Lesson by Kirk and Kimmie. Free admission before 7:00 p.m., and $5 at the door afterwards. U of M Swing every Monday in Fieldhouse Room 118 from 7:00 to 9:30 p.m. Free taster lesson from 7:00-8:00 p.m. Topics vary from week to week and include East Coast Swing, Lindy Hop, Charleston, Blues and Balboa. All are welcome and no partner is required. Open practice from 8-9:45pm. Improve your moves during this dance time. Ask questions, come practice your swing dancing and have fun with other Memphis swing dancers! This morning's Sunrise Serenade was "I Got A Gal In Kalamazoo" by Glenn Miller and his Orchestra. Click on the song title to listen courtesy of Jazz On Line. On July 27, 1940, Warner Bros. released A Wild Hare, considered by many to be the first appearence of the Wascally Wabbit in his final form. This was not Elmer Fudd's first appearance, but he was closer to what would become his final form than in earlier shorts, and this picture established the basis that would eventually be refined into the final version of Elmer. Both characters' opening lines would become catchphrases. Happy 70th Birthday Bugs! Today's Sunrise Serenade was "Basin Street Blues" by Ella Fitzgerald and Bing Crosby. Click on the song title for the album page on emusic. Sample clip at Track #5. As a post on Modern Mechanix indicates, ingenuity is timeless. In 1946, this young lady solved her personal housing shortage by buying a surplus bus and converting it into a home, and a pretty stylish-looking one at that. This morning's Sunrise Serenade was "Jeepers Creepers" by Louis Armstrong. Click on the song title to listen courtesy of Jazz On Line. In this 1942 animated short, scientists discover a frozen dinosaur in the arctic, bring it to Metropolis, where it thaws out, comes to life, and causes mayhem. This looks like a job for "You Know Who!" From the Internet Archive, here is Superman in The Arctic Giant. Today's Sunrise Serenade was "Marie" by Tommy Dorsey and his Orchestra. Click on the song title to listen courtesy of Jazz On Line. Things were different in 1938, but this ad featuring actress Delores Del Rio still made me do a double-take. 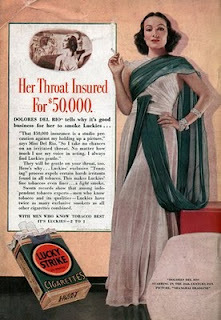 Posted on Modern Mechanix, it reveals that her studio had an insurance policy on her throat for $50,000 as a precaution against her holding up a picture by loss of her voice. As a result, she "took no chances" on an irritated throat, and smoked Lucky Strikes! This morning's Sunrise Serenade was "Rockin' In Rhythm" by Duke Ellington and his Orchestra. Click on the song title to listen courtesy of Jazz On Line. The playlist for the July 21, 2010 broadcast of the Swing Shift Shuffle has just been added to the playlist filing cabinet. 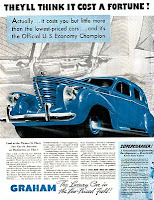 Boing Boing happened across one of my favorite car designs when it referred to a post about this ad for a 1938 Graham. This partcilar model became known, for obvious reasons, as the "Sharknose." This car is what you might imagine a fictional Art Deco car to look like, but it was real. Despite the innovative design, it was not a great seller. This morning's Sunrise Serenade was the old World War I marching song, "Pack Up Your Troubles In Your Old Kit Bag," recorded as a V Disc during World War II by Lt. Bob (Bing's little brother) Crosby and Martha Tilton. Click below to listen, or on the song title for the link to mp3hunting.com. By the way, the line "a lucifer to light your fag" is an old UK expression referring to having a match to light a cigarette. The weekly Red Hot Lindy Hop lesson and session continues this Friday night. Lesson by Kirk and Michelle, and music by DJ Alexis. Free admission before 7:00 p.m., and $5 at the door afterwards. This morning's Sunrise Serenade was the classic "Take The A Train" by Duke Ellington and his Orchestra. Click on the song title to listen courtesy of Jazz On Line. The Film Noir Photos blog posted about the print/web magazine America In WWII. I have seen the print version at newsstands, but never visited the website before. 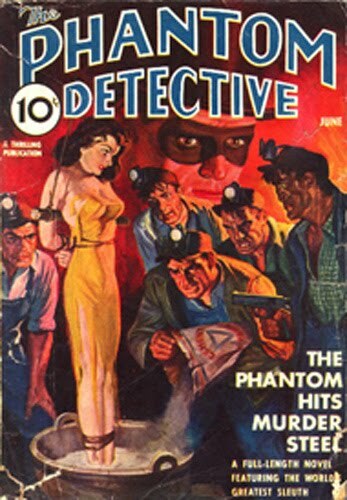 In addition to a large amount and variety of information about the purely military aspects of World War II, the site includes features about life on the home front, including a gallery of pulp fiction covers of crime, westerns and science fiction; and the story of how Veronica Lake changed her trademark "peek-a-boo" hairstyle to help the war effort. This morning's Sunrise Serenade was "And Her Tears Flowed Like Wine" by Ella Fitzgerald. Click on the song title to listen courtesy of Jazz On Line. Like the hunter, I am a firm believer in a good night's sleep. From the Internet Archive, here is the 1949 MGM animated short, directed by Tex Avery: Doggone Tired. Believe it or not, that is how one Hollywood publication referred to Katherine Hepburn in 1938. 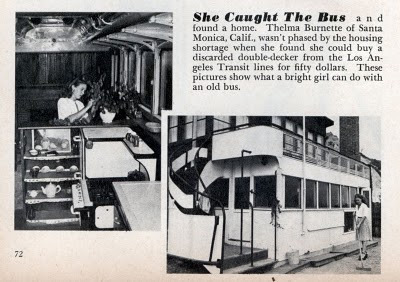 Classic Movies Digest did a nice article about that low point in her career, including commercially disastrous film Sylvia Scarlett, in which she played a woman disguised as a young man. This morning's Sunrise Serenade was "Downhearted Blues" by Red Norvo with Mildred Bailey on vocal. Click on the song title for the album page on emusic. Sample clip at Disc 1, Track #35. There are occasions when you wonder if technology actually went backwards. 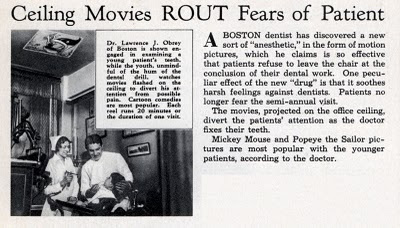 Modern Mechanix posted this article about a dentist in 1936 who projected movies on his ceilings to calm his patients. This was way before television, much less flat-screens and DVD players. Why do we not have this now? My dentist has a poster of some kittens on the ceiling over the chair. Today's Sunrise Serenade was "Ace In The Hole" by Anita O'Day. Click on the song title to listen courtesy of Jazz On Line. The playlist for the July 7, 2010 broadcast of the Swing Shift Shuffle has just been added to the playlist filing cabinet. 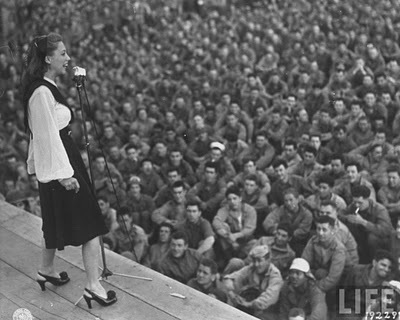 From Film Noir Photos and August 1944, a shot of singer/actress Dinah Shore performing for U.S. troops in France. This morning's Sunrise Serenade was "Victory Polka" by the Old Time Polka Band off a V Disc. Click on the song title for the album page on emusic. Sample clip at Disc 2, Track #14. The weekly Red Hot Lindy Hop lesson and session continues this Friday night. Lesson by Erin and Jaredan, and music by DJ Jaredan. Free admission before 7:00 p.m., and $5 at the door afterwards. This morning's weather in Memphis might be termed a "soft day" in Ireland. Appropriately enough, today's Sunrise Serenade was "Danny Boy" by Glenn Miller. Click on the song title to listen courtesy of Jazz On Line. Here is an interesting post from Dull Tool Dim Bulb. It appears the dashboard-mounted camera, a mainstay of current police reality television, was invented by a Los Angeles newspaper photographer named Mell Kilpatrick in the 1940's. Mell was attracted to photography young and certainly had the right eye. In the only photo I’ve found of him, he is posing as if squinting into a lens finder. Like a Weegee in sunshine, he traveled light…camera, flash, tripod and a trench coat when the road was slick. But he also had a camera mounted on his dashboard pointing through the windshield and I am sure these photos were shot with it. Like a hard-boiled P.O., whenever California blood was spilled, he was there. Crime, Crash, Insurance Fraud…he squinted through them all in black and white. This morning's Sunrise Serenade was one of my favorite novelty tunes, "Your Feet's Too Big" by Fats Waller. Click on the song title to listen courtesy of Jazz On Line. Here is a new one for me: a Paramount Noveltoon featuring Herman the mouse and Henry the chicken and a little marital boxing. From the Internet Archive, the 1946 animated short, Sudden Fried Chicken. 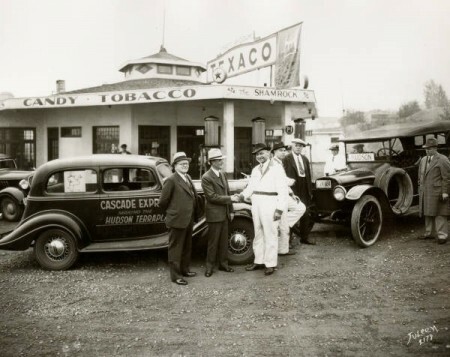 Back in the first decades of the automotive industry, carmakers used their vehicles for all sorts of publicity stunts to get customers into the showrooms. In addition to racing, endurance runs demonstrating the reliability of the cars were popular. The Hemmings blog posted an interesting item about the Hudson-Terraplane Ruggedness Runs from the 1930's, explaining the concept and noting their apparent effectiveness. 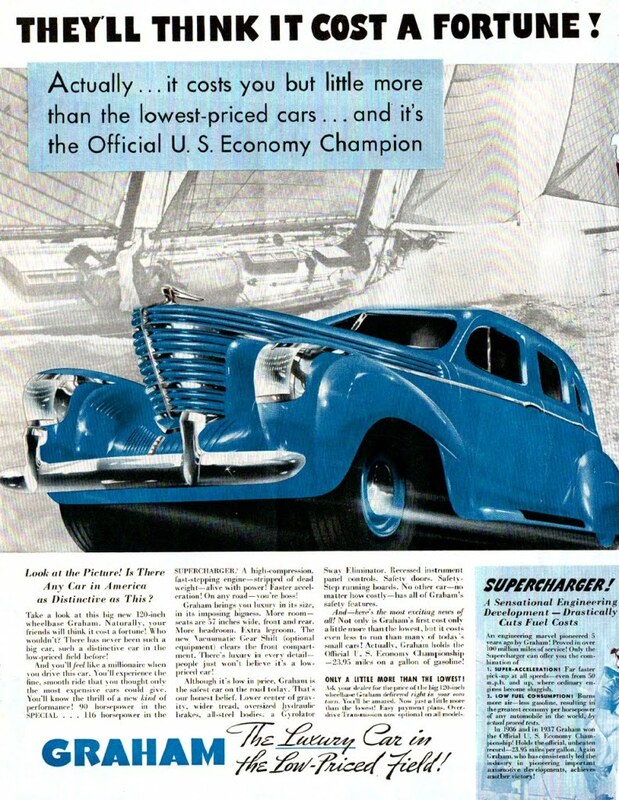 As we see in a few contemporary newspaper articles, Hudson planned about 20 such Ruggedness Runs across the country, each using a 1934 Terraplane already in the hands of a customer, sent out for two weeks straight on pre-selected circuits (or “Ruggedness Routes”) of 1,500 to 1,800 miles. . . . The Ruggedness Runs certainly worked in attracting newspaper coverage as well as in selling newspaper ads right underneath the coverage and in attracting customers to Hudson-Terraplane showrooms. They very well could have also been instrumental in causing Terraplane sales to jump from 56,804 in 1934 to 70,323 in 1935. Today's Sunrise Serenade was "Battle Of Swing" by Duke Ellington. Click on the song title for the album page on emusic. Sample clip at Track #15. 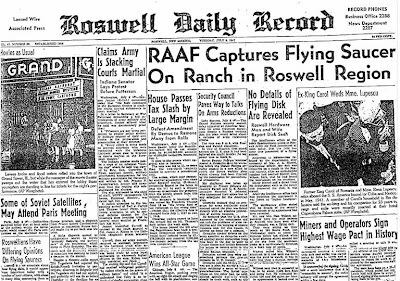 As noted by The People History, on July 8, 1947, reports began to surface that U.S. Army Air Force personnel "captured" a flying saucer near Roswell, New Mexico. 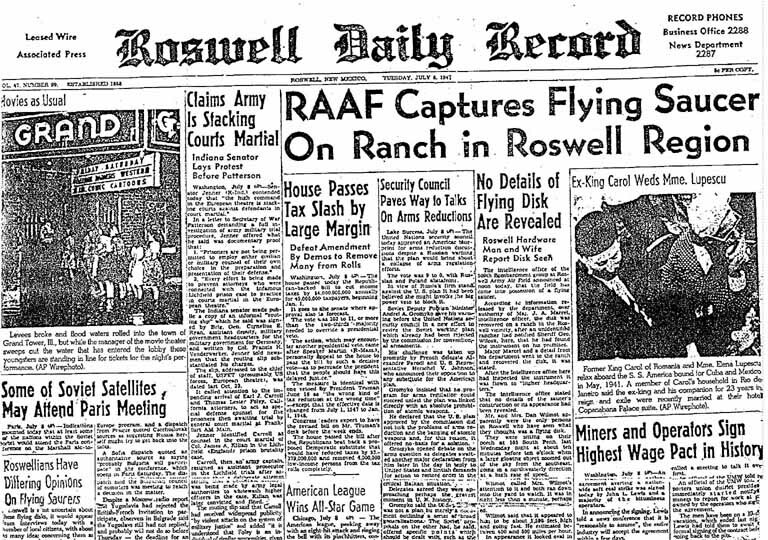 Of course, government officials subsequently explained that absolutely nothing out of the ordinary happened (or did it?). This morning's Sunrise Serenade was "Sugar Blues" by Ella Fitzgerald. Click on the song title to listen courtesy of Jazz On Line. 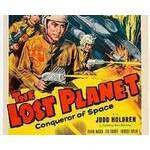 Thanks to Todd's Serial Blog for posting that Comicweb.com started a new serial webcast this weekend featuring The Lost Planet. You can watch the episodes at Comic Web's Serial Cliffhanger Theater, by videopodcast, or on blip.tv. This morning's Sunrise Serenade was "Brass Buttons and Epaulettes" by Raymond Scott. Click on the song title for the album page on emusic. Sample clip at Disc 1, Track #17. Keep the Independence Day spirit swinging with the weekly Red Hot Lindy Hop lesson and session this Friday night. Lesson by Matt and Becky, and music by Becky. Free admission before 7:00 p.m., and $5 at the door afterwards. Keeping the Independence Day spirit alive, this morning's Sunrise Serenade was "Fightin' Doug MacArthur" by Anita O'Day. Click on the song title for the album page on Amazon.com. Sample clip at Track #6. For Independence Day weekend, Porky Pig, Uncle Sam and the folks at Warner Bros. give us an American history lesson in Old Glory Porky Pig. I have been unable to keep track of the coming attractions on Turner Classic Movies recently, but I finally was able to review the July schedule, and this month is starting off well. TCM will air The Wizard Of Oz both tonight and tomorrow, as well as several other classics from the 1930s-40s. 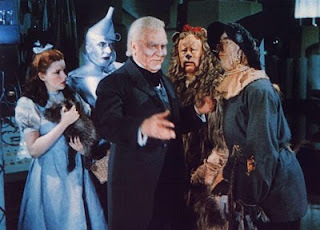 The Wizard Of Oz is a fun film, but for me, Judy Garland singing "Over The Rainbow" right at the start is what makes the movie. Mr. Smith Goes to Washington and Yankee Doodle Dandy will make great Independence Day watching. Today's Sunrise Serenade was another holdover from Wednesday's Swing Shift Shuffle broadcast: "Rhythm Saved The World" by the Mills Brothers. Click on the song title to listen courtesy of Jazz On Line. Appropriating a popular entertainment idea is hardly new. 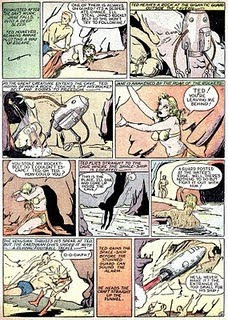 As noted in Pappy's Golden Age Comics Blogzine, the similarity of the brief 1940 series Space Rovers to the Flash Gordon comic strip may have been one of the reasons it did not last longer. Copyright owners are funny that way. This morning's Sunrise Serenade was a leftover from last night's Swing Shift Shuffle broadcast: "The General Jumped At Dawn". This particular version comes from a collection of war years recordings by Bing Crosby, but you will not hear Bing singing. Instead, it sounds like the background vocalists that accompanied him on other cuts on this album. I cannot find any information on the vocalists, but they sound good. Click on the song title for the album page on emusic.